Best known as the tree that produces Bay Leaves, Laurus nobilis also makes a good evergreen garden plant. Attractive green foliage year round is the main feature. If you are looking for a hedge with a difference then a BayLeaf Hedge may be for you. Its fragrant, very hardy once established, fragrant foliage and will grow in full sun to a little shade. It can also be pruned to a low hedge of around 1m or a taller hedge to 3 metres plus. This is a very upright tree that will reach a height of 5 – 7 metres over time. 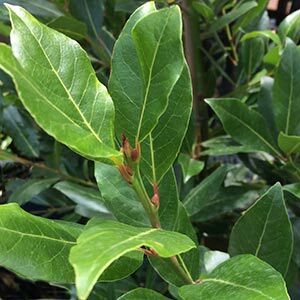 Laurus nobilis is available for sale in a number of forms and cultivars as well as a standard for. A hardy, drought tolerant and salt tolerant tree ‘Mile’s Choice’ – Mile’s Bay Laurel is a widely sought after form. Often grown in the kitchen garden where it can be grown as a standard with other plants growing below. Although used widely for culinary purposes L. nobilis (Bay Tree) also make a great hedging plant. L. nobilis ‘Saratoga’ is the Sweet Bay. L. nobilis angustifolia is the Narrow Leafed Bay or ‘Willow Bay’. L. nobilis ‘Mile’s Choice’ is a more compact form. Bay laurels are a frost hardy drought tolerant plant once established. Height – To 7 – 8 metres over time. – Easily pruned to 2 – 3 metres. Spread – Will form a crown of around 3 – 4 metres. Soil – Humus rich well drained, however tolerant poorer and sandy soils as well. Foliage – Deep green and glossy.